The Last Generation - Sixth grade students at Joseph A McGinley School in Willingboro are among the last generation to talk directly with Holocaust survivors. 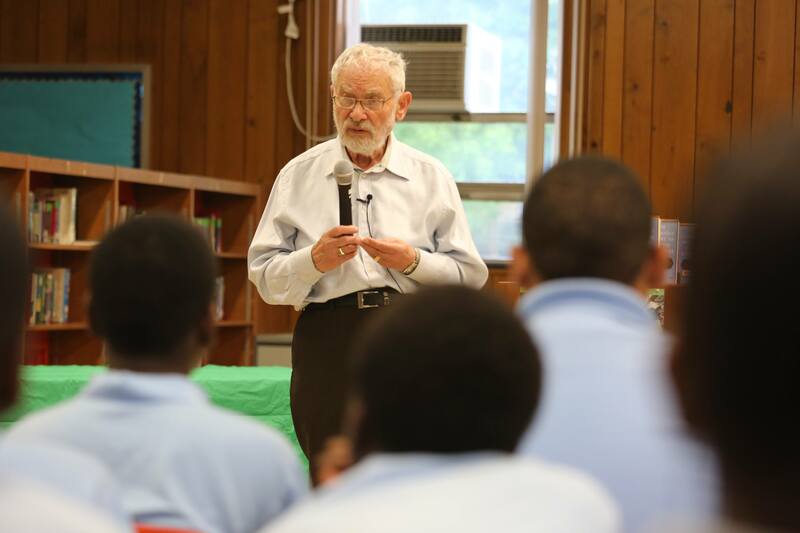 The students hear the stories of 86-year-old Ernie Gross who was only 15 years old when he and his family were deported to a ghetto, and then to Auschwitz. He lost five members of his immediate family, with only two brothers and one sister surviving. He tells the students that people have differences but we are all equal, and that hate is not the answer. CHE is a professional development organization for educators who teach about the Holocaust, genocide and human rights. CHE grew out of a long-standing need for educators to organize as professionals and to become a voice for teachers and students participating in Holocaust/genocide education. CHE is committed to the effort to instill in our students a sense of the importance of recognizing and respecting the value of each individual human life and the human dignity of all people as a deterrent to future genocide and to foster a peaceful world. CHE provides its members with the opportunity to find mutual support from colleagues in their educational efforts and to further the instructional program and goals of Holocaust education through ongoing professional development. CHE provides opportunities for networking and professional development designed by teachers for teachers. On Facebook search for Council of Holocaust Educators.